Ghost Bunny saw them run out and down the hill. The Hellfire Club was awash with flames. "Hallowe'en is over!" she yelled; "We make it so!" Her ghostly cohorts fluttered hauntingly across the scene, quenching any remaining glitches in the temporal zone. Far below, Lapinette waved them on. Skratch the Cat leapt around like a kitten. Major Spitlove gripped Captain Jenny's tunic in terror. "Ghosts!" Wabsworth tugged one of Lapinette's ears and whispered, "No such things." The Wabbit slid to a halt, puffed a sigh of relief and chortled. "You're late, Ghost Bunny." Ghost Bunny howled with laughter. "Alas Commander, it is you that's early." "What happened to the creatures?" asked Lapinette. "Toast!" shrieked Ghost Bunny. Major Spitlove shuddered and drew close to Captain Jenny. "And where did you find your ghostly cohorts?" said Skratch. "I met them on the astral plane," giggled Ghost Bunny. 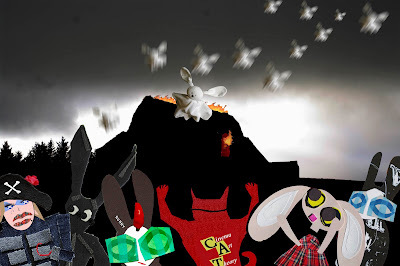 The Wabbit watched the flames die down. Dust settled. The air cleared. "Do you have your radio, Wabsworth?" "No," replied Wabsworth, "I'm afraid I danced on it." "Then we can't call for transport home," sighed the Wabbit. "My cohorts will take you!" shrieked Ghost Bunny. Major Spitlove started down the hill and called back. "Nice night for a walk."